What does Easter mean to you? Do you still feel its essence on this 6th week of Easter? How do you live as part of an Easter people? For today, try to put yourself in the shoes of one of Jesus’ followers who were first to arrive on the mysterious scene at the tomb, early morning at the break of dawn on the third day after His death. How would you react seeing the rolled stone, burial cloths and even angels? What do your senses tell you? What emotions are running high? As you contemplate and pray with the song, “He is Risen” by Paul Baloche, try to answer the questions above and speak with the Risen Lord about your thoughts and feelings. Listen also to what He wants to reveal to you during this time of prayer. Six weeks have passed since we celebrated the Resurrection of Christ, are you still joyful and enthusiastic in proclaiming and living out His Gospel to the whole world? We may find ourselves burning with great zeal and desire to follow Jesus and share His love with others. However, there are also some of us who may find the joy and light of Easter dwindling. We need to understand what “Christ is risen” truly means, and that His rising from the dead is not the end of the story. This Easter season not only reminds us of celebrating Jesus’ ultimate sacrifice and triumph over sin and death for our sake, but it also compels us to fulfill our mission that Jesus has entrusted to us in whatever vocation we have chosen or find ourselves in. We are an Easter people, a people with great joy and love. We strive to serve & love God and our neighbor as Pope Francis challenges us follow. May your Thursday and everyday proclaim, “Hallelujah” in all your words and deeds! Many thanks to integritymusic for the video and for Delson Balance for the reflection! We are so blessed this day because we have three psalm settings to share for the Ascension of the Lord. The psalm setting in Filipino is by Migs Miguel, and the two settings in English are by Tinnah M. dela Rosa and Kent Lardizabal. Please click the pictures or the highlighted link to download the high resolution PDF files of our composers. Click the highlighted link to view the readings in English for next Sunday (June 1, 2014) via the US Conference for Catholic Bishops website or the readings in Filipino via the Word and Life Publications. Have you ever sacrificed anything for someone? Sacrifice is such a powerful word. Sacrifice equates to love. Love has no boundaries, no second thoughts. Love is giving and selfless. And this is how God has been to mankind. It is so amazing how God manifested His love for us. He sent His Son to become a man like us, in the person of Jesus, to carry our cross as his own. Such sacrifice done by Our Father! 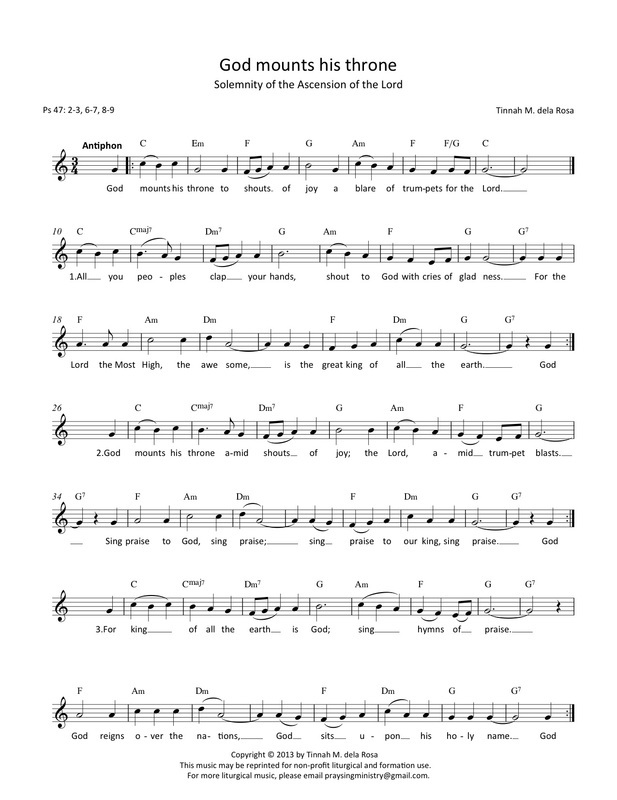 As we pray with this song, “All that You are,” let us recall the sacrifice Jesus did for us. His sacrifice would give out our salvation. His sacrifice would cost His own life. We were filled with sorrows and pain, but Jesus took it all away. God is a loving God that He promised Jesus’ Resurrection after three days. Indeed, the joy of Easter Sunday passes through the sufferings of Good Friday. Let us remember the Good Fridays of our lives will always be replaced by happy Easter Sundays, as what God has promised us. He is such a faithful God for promising this to us, despite our shortcomings to Him. In thanksgiving, let us praise Jesus through worship even in the simplest form—be it doing something good to others, praying to Him, or offering our time and talent in the service of His church and of others. Many thanks to David Maxey for the video and Em Alcantara for the reflection. Would you like to improve your skills in leading people to pray? The Christian Life Community of the Philippines (CLCP), through its Formation Institute (CLCFI), invites you to Teen Treats Facilitators Training from May 26 – 31, 2014 in Horacio dela Costa Formation Center and Retreat House, Trece Martirez, Cavite. The main facilitator is PraySing Ministry's founder and artistic director, Tinnah Dela Rosa. In its second year, the Teen Treats Facilitators Training offers an opportunity for those engaged in the helping profession (e.g. teachers, campus ministers, retreat and recollection facilitators, counselors, parish workers, lay ministers) to learn about group guided Ignatian retreat module design-making and group facilitating skills. Lectures, workshops, and group dynamics will be used as learning tools throughout the training. Program starts on May 26 (Monday), 8:30 am and ends on May 31 (Saturday), 1:00 pm. Learning investment is Php 7,500 which covers board and lodging for 5 ½ days and training materials. Discounts are available for participants who will register in groups of four (4). For reservations or inquiries, please contact CLCFI at telephone numbers 4260074-75 or email clcfi@admu,edu.ph. Our psalm setting in English for the Sixth Sunday of Easter is by Tinnah M. dela Rosa. Please click the picture or the highlighted link to download the high resolution PDF file of Tinnah. Click the highlighted link to view the readings in English for next Sunday (May 25, 2014) via the US Conference for Catholic Bishops website. Would you believe in something you cannot see? Would you follow someone you do not even know? And would you love someone whom you have not even seen? Perhaps most of us value the saying, “to see is to believe”, just like Thomas, one of Jesus’ apostles who expressed his doubt and disbelief to his friends. And of course, no one would dare follow a complete stranger and obey what he or she says. Moreover, it would seem highly improbable to love someone we haven’t met or seen. However, as our Lord has shown us, these are possible with the eyes of faith, with a touch of hope and a heart filled with love. This season of Easter reminds us of God’s great love for us - by dying on the cross for us and rising on the third day to conquer sin and death and give us new life. We turn to Him in times of sorrow and despair amidst the darkness and confusion. In times of joy, we are actually in His dwelling place secured by His blessings and guidance even though at times we do not see or realize this. May you have a faith-filled, hope-enthused and love-abounding Thursday and everyday! Many thanks to markanthonynapao for the video and Delson Balance for the reflection! 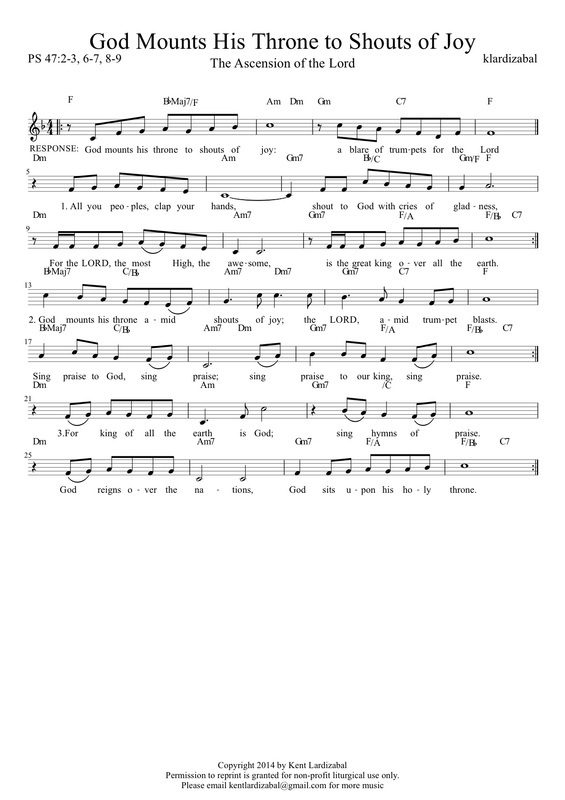 PraySing Ministry's featured material is a song apt for Pentecost Sunday (June 8, 2014), Masses of the Holy Spirit or the Rite of Confirmation. This excerpt of the choral piece "Fire of the Spirit" is composed by Tinnah dela Rosa for the Gaudium Mass, with words by Jan S. Pickard. It is one of the 29 tracks in the Gaudium Mass CD and 43 pieces in the songbook. Today we are sharing two psalm settings for Fifth Sunday of Easter. 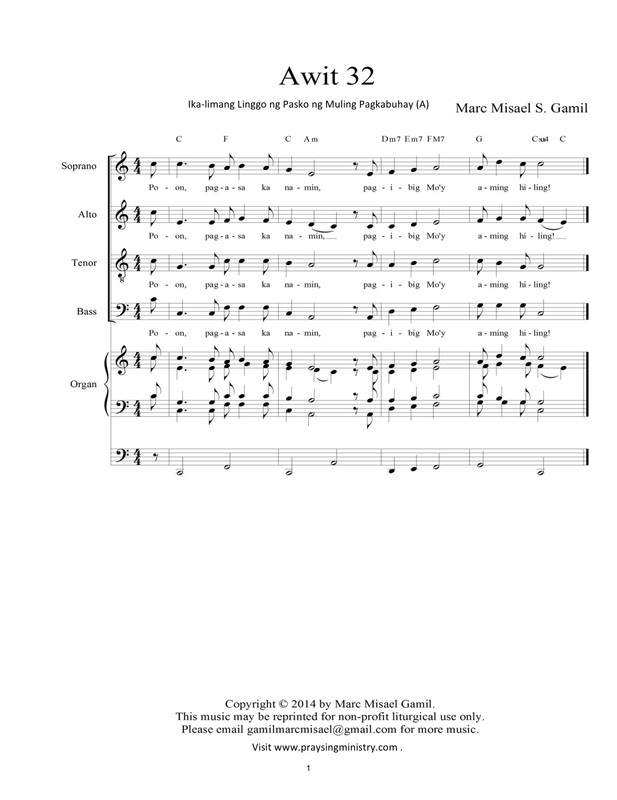 The 3-page psalm setting in Filipino is by Marc Gamil and the setting in English is by Tinnah M. dela Rosa. Please click the pictures or the highlighted link to download the high resolution PDF files of our composers. Click the highlighted link to view the readings in English for next Sunday (May 18, 2014) via the US Conference for Catholic Bishops website or the readings in Filipino via the Word and Life Publications. Have you ever loved and lost - a spouse, a child, a friend, or a source of security? Our life is full of seasons when transitions and changes can leave us feeling abandoned and isolated or lonely and vulnerable. The disciples at the last supper probably felt deeply troubled when Jesus announced that He was leaving. After all, the One for whom they left everything behind said He was leaving. But Jesus assured them that He will not leave them orphaned. He promised his disciples that He will send an advocate - the Holy Spirit - to be with us. We can see here that regardless of the circumstances or seasons of our life God promises to never leave us. As you listen to the song, "I will never leave you," by Scripture Lullabies, imagine the Lord saying the words of this song to you. "I will never leave you nor forsake you. Know that I am with you. You will never be alone." What feelings are stirred in your heart as you imagine the Lord say these words to you? How are you moved? Speak to the Lord about His promise and listen to what He has to say. In prayer, thank God for keeping His promise. God has sent us the Holy Spirit of love to accompany us, to inspire us, to move us and transform us. Such knowledge of God's abiding love is so awesome to behold. But it is a truth of our faith - that our God will never leave us nor forsake us. May your Thursday be filled with the awe-inspiring and faithful love of God. Many thanks to ciarainthebeloved for the sharing the video! 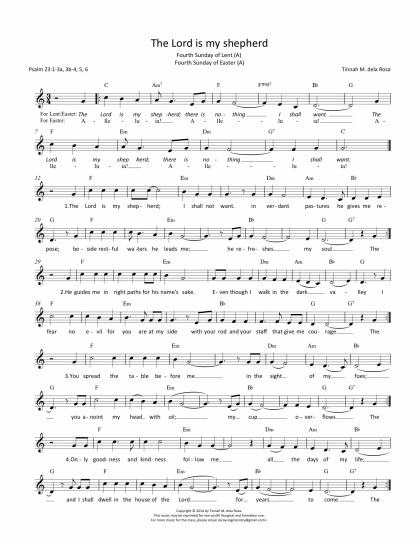 Looking for a song for Pentecost Sunday (June 8, 2014)? Look no more! PraySing Ministry's featured material this Tuesday is the melodic line of the choral piece "Fire of the Spirit" composed by Tinnah dela Rosa for the Gaudium Mass, with words by Jan S. Pickard. 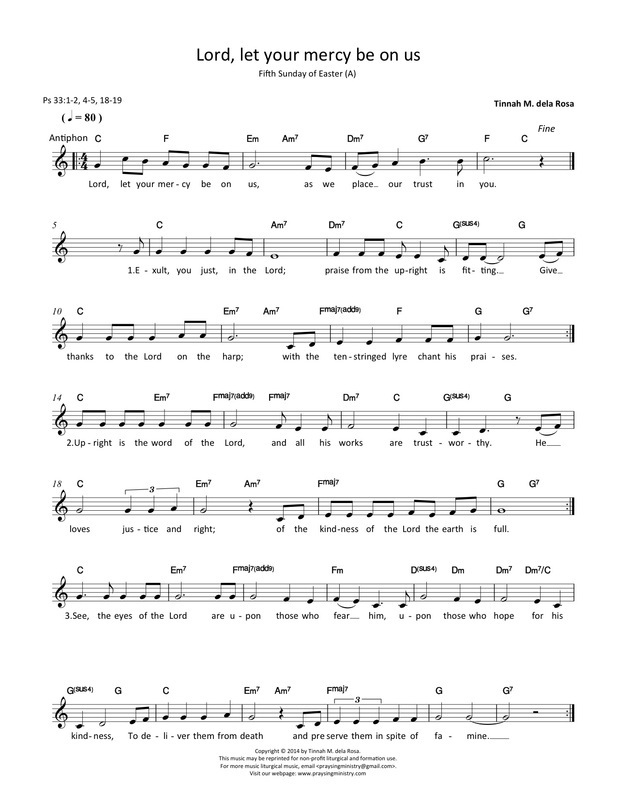 We are so blessed this day because we have three psalm settings to share for the Fourth Sunday of Easter. 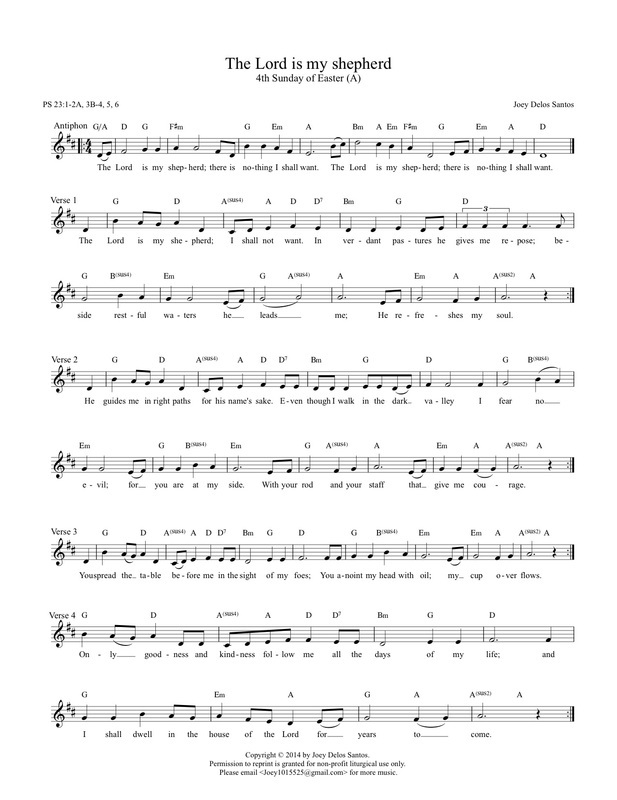 The 2-page psalm setting in Filipino is by Dennis N. Marasigan, and the two settings in English are by Tinnah M. dela Rosa and Joey Delos Santos. Psalm 23 promises you Christ's loving and protective presence as you continue on your journey of discipleship. This journey is a long one and the possibilities of becoming lost, losing hope, being misled are real. But there is a Shepherd who is both by your side and ahead of you, one who has already journeyed the way of death and resurrection and knows its path. As you sing, take his hand and walk confidently. Please click the pictures or the highlighted link to download the high resolution PDF files of our composers. Click the highlighted link to view the readings in English for next Sunday (May 11, 2014) via the US Conference for Catholic Bishops website or the readings in Filipino via the Word and Life Publications. As you listen and watch the song video, "You Were There" by Avalon, what are the thoughts and feelings running through your heart and mind? Are they feelings of resonance? Questions of faith? Name and recognize them. Speak to the Lord about the most significant thought or feeling that arose. To journey through and comprehend God's actions is sometimes difficult to do. It's not an action that is entirely our own, but an action that requires the spirit of prayer. A leap of faith is possible when we recognize God in our life. May our minds and hearts be opened as David, Abraham and Jesus did. And may this Easter celebration continue to reassure us of the resurrection in store for us at the end of this journey. Many thanks to myprincefroggy for the video and to Friel Canto for the reflection.